Nine years ago, during a "dream family vacation" at Walt Disney World in Orlando, Florida, 9-year-old Katharine Rhoten (or "Katie," as she likes to be called) became so ill she had to be rushed to a local hospital. "She was in shock, and my husband and I were in shock," Katie's mom, Kristin Everett, tells us. Following more "pokes, prods and tests" than Katie cares to remember, doctors diagnosed her with Type 1 diabetes. It was a difficult diagnosis, especially for a family with no known history of the disease. But before leaving the hospital, Kristin and her husband recall giving their frightened daughter this advice: "We told her that going forward, she could live her life one of two ways. She could either be an advocate, or she could be a victim," Kristin, a media relations specialist with Mayo Clinic's Department of Public Affairs, tells us. Heady stuff for a 9-year-old. But Katie's choice would soon become clear. She would be an advocate. And her experience in Orlando helped her figure out how. Each time she had a "new poke or procedure," she was given a stuffed animal to distract her from the pain. "Being so far away from home and just knowing someone I'd never met cared enough to donate something to help sick and scared children like myself was something I knew I also wanted to do," Katie tells us. "That's how the idea for Katharine's Wish began." In the nine years since, Katie and her charity have grown and matured together. And they've had the generosity and support of the Eau Claire, Wisconsin, community to help them along the way. "During our first year we donated around 100 toys," Katie tells us. "Today, all combined, we're close to 24,000 toys and stuffed animals that we've donated to pediatric hospitals all over the country, which is just mind-blowing to me." It's also mind-blowing to those on the receiving end. Like Stacy Hein, Perioperative Services supervisor at Mayo Clinic Health System in Eau Claire, who was on-hand to welcome Katie's latest donation to Mayo Clinic, as Eau Claire's News 18 WQOW.com reports. "It was pretty amazing to see," Stacy tells us. 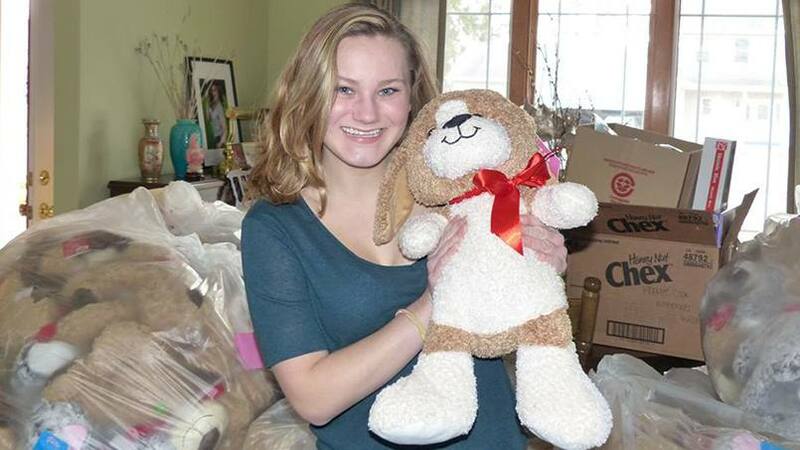 "There were bags and boxes full of stuffed animals, books and every other toy imaginable. It was almost overwhelming to see how much stuff she and her foundation brought to us at one time." Stacy tells us Katie's donation will be "put to good use" with the pediatric patients she and her colleagues serve. And Katie tells us that's why she continues her mission, even as a busy high school senior. "The whole reason I started Katharine's Wish is because I wanted to help other sick kids," she says. "Over the years, this has also helped me accept my own diagnoses and shown me that my diseases don't define me. And I want to show other kids that their diseases and their illness also do not define them." You can learn more about Katharine's Wish here. Then grant us a wish by sharing your comments below. You can use the social media tools atop this page to share this story with others.